He’s known primarily for booming body checks, but when it comes to lowering the boom when a big goal is needed, Brent Seabrook can definitely deliver. A solid evening on the Chicago blueline ended with a great morning for Seabrook and his teammates, as the Blackhawks went the distance (and then some) with a 3-2 triple overtime win over the Nashville Predators. Seabrook’s goal on a heavy shot from the point just one minute into the third extra frame ended the proceedings that started on Tuesday night and finished Wednesday morning. The goal gave the Blackhawks a 3-1 series lead against the Predators as the Western Conference quarterfinal shifts back to Nashville. STAT PACK: Seabrook had 33:30 minutes of ice time in the victory, taking 50 shifts and registering two shots on goal. 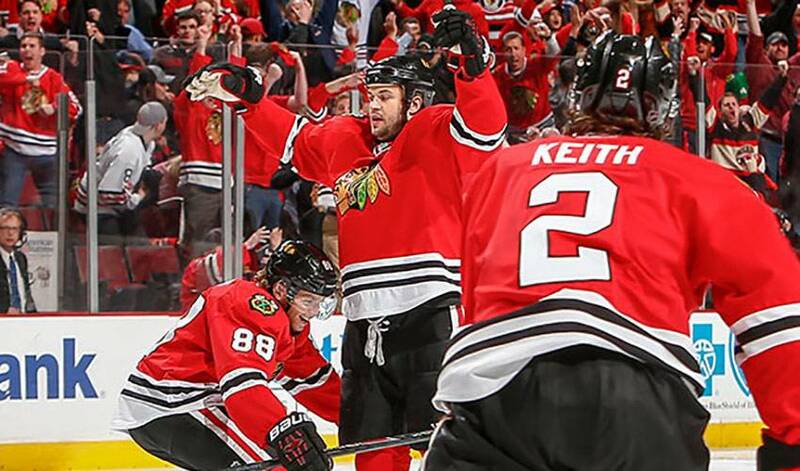 NEED TO KNOW: Seabrook netted the last goal in Chicago's 4-2 Triumph in Game 3 against the Predators on Sunday. He also had two overtime winners in the Hawks' Stanley Cup title run in 2013. BEFORE THEY WERE (NHL) STARS: Seabrook played youth hockey in British Columbia (Canada) with the ‘Pacific Vipers’, along with three future NHL teammates, Colin Fraser, Troy Brouwer and Andrew Ladd. EARLY/LATE PRESENTS: Seabrook, who turned 30 on April 20, has found the scoresheet in the 2015 playoffs, just not on his special day! He scored one day before his birthday and two days after it. GOLD AND SILVER: Seabrook won a gold medal with Team Canada at the 2003 World U18 Championships, the 2005 World Championships and the 2010 Winter Olympics. He won the Stanley Cup with Chicago in 2010 and 2013. SMALL SCREEN SCENE: In 2014, Seabrook, and teammate Duncan Keith, made a cameo appearance on the NBC drama Chicago Fire. BIG SCREEN SCENE: Seabrook’s hometown of Tsawwassen, B.C. has been the setting for scenes in numerous high-profile movies and television shows over the years, including The X-Files, Jumanji, Insomnia and Snakes on a Plane. HONOURABLE MENTIONS: Past Playoff Performer of the Night Petr Mrazek made 22 saves in a 3-0 Detroit win over the Tampa Bay Lightning. Nicklas Backstrom (1G, 1A) had the overtime winner for the Capitals, who knotted their series against the Islanders at two games apiece. Jiri Hudler (1G, 1A) helped pace the Flames to a 3-1 victory over the Canucks in Game 4 of their series (Calgary leads 3-1).